As an award-winning international interdisciplinary researcher in law, public health, science and psychology, Veronica Fynn Bruey has conducted research studies, consulted on projects and spoken at international conferences in over 20 countries across Africa, Australia, Europe, Asia and North America. With over 14 years of experience Veronica has held teaching and research positions at William V S Tubman University, Australian National University, Cuttington University, and the University of British Columbia. She has published eight books and book chapters, 19 peer-review articles, book reviews and several reports in law, public health, Aboriginal issues, gender studies, human trafficking and (post)/colonial violence. Her PhD dissertation focuses on systematic “Gender Violence and the Rule of Law: Indigenous Communities in Post-war Liberia and Australia,” while her Bachelor of Laws thesis “Critically Assess the Legitimacy of Modern Democracies in England’s Constitutional Monarchy”. Veronica is an avid advocate of law and policy reform regarding race and ethnicity, human rights, social justice and equality. 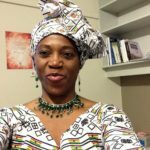 In 2001, while an undergraduate at the University of British Columbia, she founded Africa Awareness, a student-driven initiative that is responsible for implementing for the first inter-disciplinary African Studies program. This curriculum development effort earned her the University of British Columbia Alumni Achievement Global Citizenship Award in 2010 and a finalist of the YWCA Young Woman of Distinction Award in 2004. In 2011, she contributed towards drafting the Liberian Mental Health Law as well as assisting the Liberia Refugee Repatriation and Resettlement Commission with domesticating the African Union Convention for the Protection and Assistance of Internally Displaced Persons in Africa (2012). By way of professional services, Veronica is a senior editor of the International Law Journal of London and a peer-reviewer of the Journals of Human Trafficking and Human Rights. Her community engagement work include sitting on the board of the World Computer Exchange (Canada) and being active member of the Law Section and International Health Section of the American Public Health Association, Indigenous Health Network, Refugee Action, Australian National University Gender Institute and the RECOGNISE Movement in Australia. Currently, she is an adjunct professor of Seattle University School of Law, a senior researcher with the Centre for Policy in Liberia and the Director of Flowers School of Public Health and Health Sciences. She is also the founder/editor-in-chief of the Journal of Internal Displacement and the founder of “Displaced Peoples”, a Law and Society Association’s collaborative research network. In her spare time, when she’s not blogging then she’s dancing, biking, hiking or running half-marathons. Veronica is a born and bred Liberian war survivor.